It seems like most of the summer has been spent either noting that I’ll be away or mentioning podcasts I’ve listened to while traveling. I’ll be gone again, but at least time the circumstances are better than most of the other recent trips as I’ll be off at a wedding in New York. Of course I’ll have my netbook with me and I’m sure I’ll still be on line intermittently, but posting will most likely be down. “When you ask me that question, I’m going to revert to my ethnic heritage and ask you a question: On what planet do you spend most of your time?” Frank asked. “You stand there with a picture of the president defaced to look like Hitler and compare the effort to increase health care to the Nazis,” he said, adding such behavior demonstrated the strength of First Amendment guarantees of what he called “contemptible” free speech. This is gibberish. Conservatives are pointing to town hall protests as evidence that the country is turning against Democrats’ proposals for health care reform. It means something that deranged political activists are showing up to these rallies and mouthing some of the same rhetoric as conservatives. Weigel is right, but I fear that responding to conservatives like McCormack with the facts is like trying to argue with a dining room table. Those universities may not have much longer to get their houses in order before they find themselves in trouble with Washington. With a letter last week, a senator who helps oversee public funding for medical research signaled that he was running out of patience with the practice of ghostwriting. Senator Charles E. Grassley, an Iowa Republican who has led a long-running investigation of conflicts of interest in medicine, is starting to put pressure on the National Institutes of Health to crack down on the practice. There are two news stories regarding potential danger to the human race. The BBC reports on methane escaping from the Arctic sea bed, which possibly could accelerate the rate of global warming. This danger sounds trivial when compared to yet another BBC report on how zombies can destroy the human race. 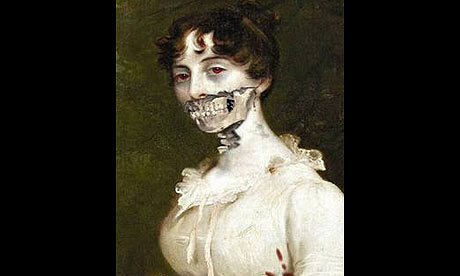 I’ve feared that zombies were a real danger ever since they invaded the world of Jane Austen’s Pride and Prejudice. In their scientific paper, the authors conclude that humanity’s only hope is to “hit them [the undead] hard and hit them often”. According to the researchers, the key difference between the zombies and the spread of real infections is that “zombies can come back to life”. Professor Ferguson went on to joke: “The paper considers something that many of us have worried about – particularly in our younger days – of what would be a feasible way of tackling an outbreak of a rapidly spreading zombie infection. “My understanding of zombie biology is that if you manage to decapitate a zombie then it’s dead forever. So perhaps they are being a little over-pessimistic when they conclude that zombies might take over a city in three or four days. It appears that between global warming and zombies we might be doomed. Fortunately there is also some good science news today. The amino acid glycine has been found in a comet according to a NASA astrobiologist. Finding such a building block of life on a comet might suggest that such building blocks of life can be spread to many planets. This potentially could lead to the development of life on another planet which is free of zombies and Jane Austen novels.